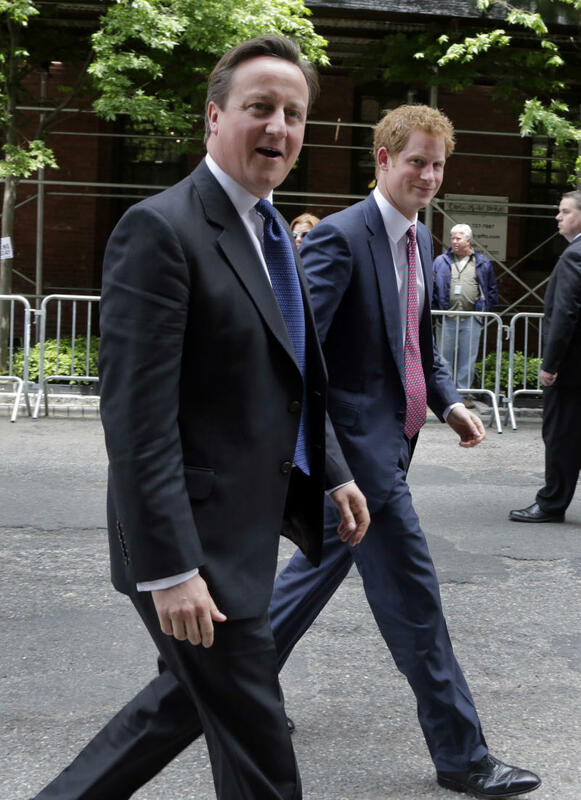 NEW YORK (AP) -- British Prime Minister David Cameron and Prince Harry visited a design studio in New York City on Tuesday as part of a campaign to promote their country as a tourist destination and U.S. business partner. The two arrived at Milk Studios on a red double-decker bus. With a view of the Hudson River from a ninth-floor penthouse, the prince and prime minister participated in a demonstration of 3-D computerized printing technology, including of two dolls that resembled the men. Prince Harry looked amused holding a likeness of himself in his British army regiment uniform, commenting on the detail of the beret and proclaiming the technology to be "cool." Cameron spoke to about 100 guests including British and American entrepreneurs. "I'm here to celebrate the special relationship between our two countries," he said. "It really struck me on this visit, first in Washington, with President Obama, talking about how our troops work together all over the world including Afghanistan, then in Boston, reflecting on the fact that both our countries have been victims of two appalling terrorist attacks, and now here in Manhattan, celebrating the immense technological collaboration between our two countries." Cameron said monthly trade between the two countries amounts to $17 billion. "And that's what we're really here to talk about," he said. "We are in a global economic race. We see this huge rise of powers in the south and east of our world, in the Indonesias, Malaysias, Chinas, Indias." He said countries like Great Britain and the United States "have to think how we best respond in that global race." The prime minister said they cannot compete primarily with wages or mineral resources. "But what we are going to compete on is our brains, our brilliance, our inventiveness, our creativity," he said. Cameron spent the afternoon at the United Nations closeted with about 25 members of a high-ranking international panel appointed by Secretary-General Ban Ki-moon to recommend the best ways to combat global poverty after the U.N. Millennium Development Goals expire in 2015. World leaders agreed at a U.N. summit in 2000 on a series of anti-poverty goals to be met by 2015, including cutting extreme poverty by half, ensuring that all children have an elementary school education, halting the HIV/AIDS pandemic, increasing the number of people with access to clean water and sanitation, and reducing maternal and child mortality. Cameron, who co-chairs the panel, told The Associated Press during a coffee break that the discussions were "very good" — a view echoed by Liberia's President Ellen Johnson Sirleaf, a fellow co-chair. The meeting will continue Wednesday and the panel is expected to present its report to the secretary-general on May 30. Britain's U.N. Ambassador Mark Lyall Grant said the fight against global poverty is "the most important" job of the United Nations and the report's recommendations on possible new goals will "kick start" global efforts to reach agreement on a set of goals to be met by 2030.